Over two school days, the Sanford Regional Technical Center welcomed close to 1000 10th Grade students from 8 different partner schools (Kennebunk, Marshwood, Massabesic, Noble, Sanford, Traip Academy, Wells and York). After a presentation at their school, these students chose to visit and, while here, experienced 3 different programs (from 20 options) for about 20 minutes each. It was neat to watch some of our current students "teach" the potential new recruits. The next opportunity to learn more about SRTC will be during our OPEN HOUSE on Wednesday, February 27th. This will take place at our new location at 100 Alumni Blvd, Sanford, ME and is a drop-by (anytime between 6:00pm-7:30pm) event where students and family can meet our staff, visit the programs and learn more about these incredible opportunities. Reminder: Any student interested in being considered for enrollment in the 2019-20120 school year must apply via our online application by Friday, March 8th. The application can be accessed at sanford.mainecte.org under "Admissions" and then "Apply Online". Any inquiries please contact Deanna Farrell, Student Services Counselor, at dfarrell@sanford.org or call SRTC at (207)324-2942. In the photo, Sanford High Students packed the Agora Presentation Area for a brief introduction with their custom schedules in hand. 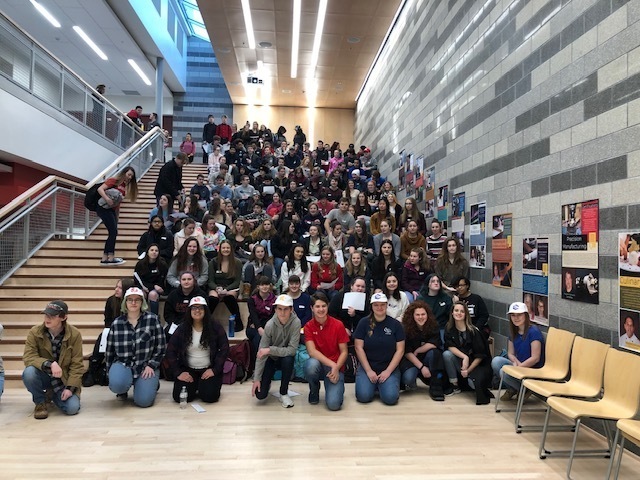 The students in the front row were the tour guides for the event, sporting a color-coordinated hat for visual representation of their career pathway.